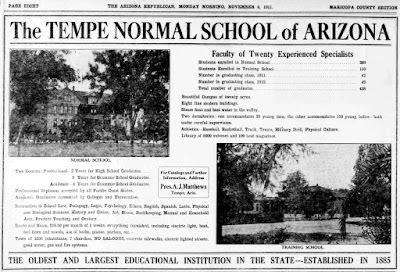 If you're an ASU alumnus, like me, you may be surprised to find that it was originally a Normal School. A Normal School is an old-fashioned term for a Teachers' School, that taught teaching "norms". The school became the Tempe State Teachers College in 1925, then the Arizona State Teachers College, until it became the Arizona State College in 1948, and Arizona State University in 1958. 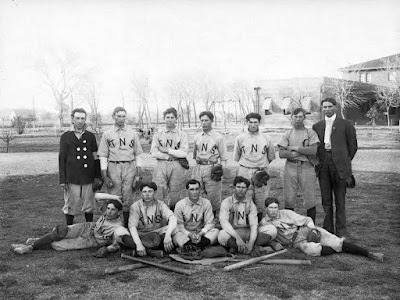 The original name for the teams was, you guessed it, the "Normals". Every once in a while I've seen reference to the team as the "Teachers", but contrary to popular belief, they were never the Owls. They became the Bulldogs in 1925, after the name of a popular dog on campus (yes, Pete the bulldog was real), and then in 1946 the Sun Angel Foundation suggested the Sun Devils, which remains to this day.